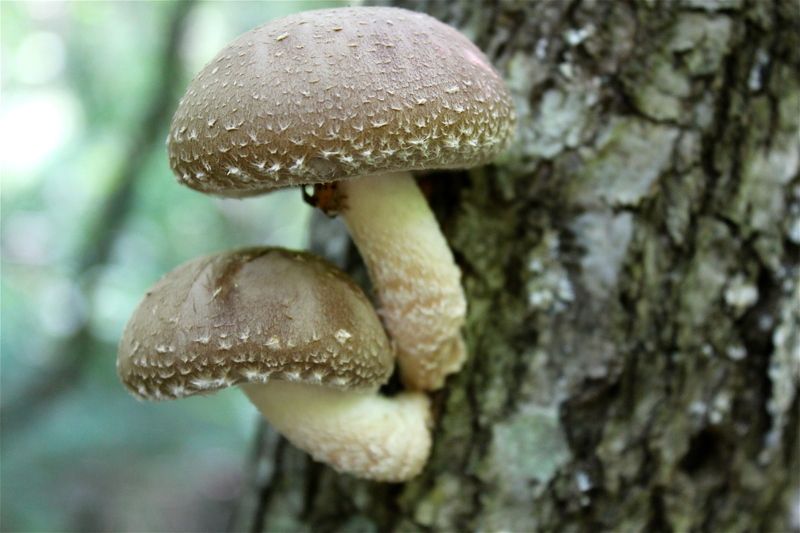 Although not a Virginia flower, and definitely not a Virginia mushroom, these shiitake mushrooms are something to crow about, so I’m including them on my blog! We inoculated oak logs two years ago in late April, and the following May we had our first mini-harvest. In early July, we got a second crop, and then later in the fall, a big bloom. Since then, the logs have fruited several more times. We discovered that if we drop them into the nearby stream and let them soak for a day or two, we can initiate a fruiting event. Mushrooms will be produced about 5 days later. That makes it easy to get mushrooms when we want them, instead of randomly. We couldn’t be more excited about growing mushrooms at home! See the slideshow below for scenes from cutting and drilling the logs, all the way through to harvest. I’ll continue to add photos if the production continues. “Shiitakes are native to Japan, China and Korea and have been grown in all three countries since prehistoric times. They have been cultivated for over 1,000 years. The Ming Dynasty (AD 1368–1644) physician Wu Juei wrote that the mushroom could be used not only as a food but as a medicinal mushroom, taken as a remedy for upper respiratory diseases, poor blood circulation, liver trouble, exhaustion and weakness, and to boost qi, or life energy. It was also believed to prevent premature aging. Click on any photo below to open the slideshow. I will check ours this week. Exciting News.